This Wesak Day which falls on the 29th May, 2018 commemorates the Birth, Enlightenment and Parinirvana of Shakyamuni Buddha, The Enlightened One. 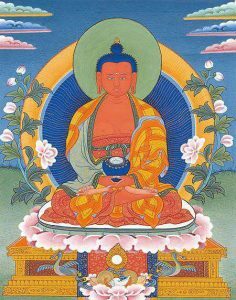 Hence, the full moon on this day should be spent engaging in virtuous activities and spiritual practice for the benefit of all sentient beings. 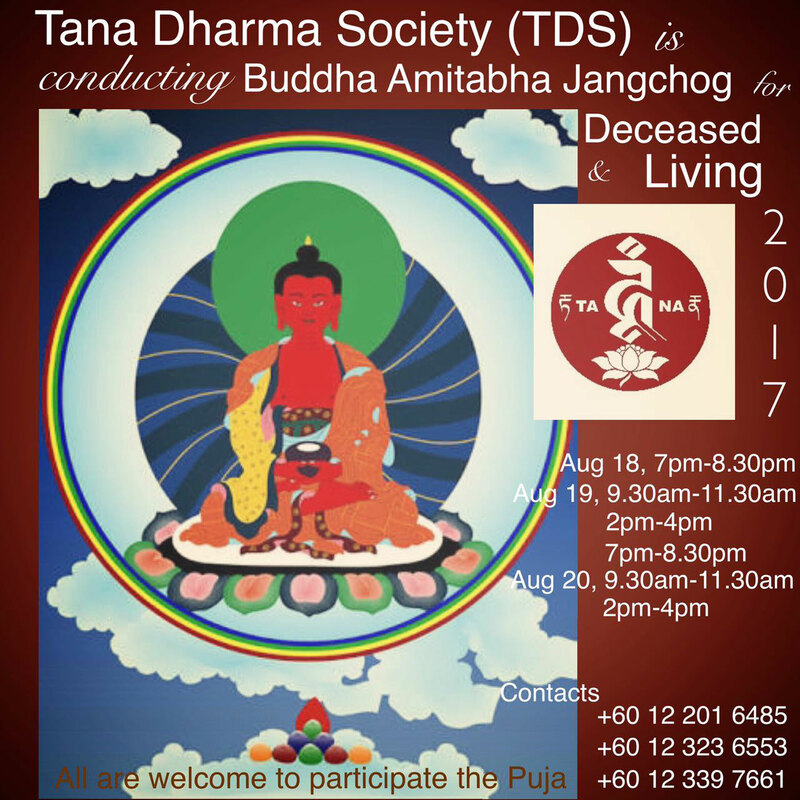 Tana Monastery will be doing a full day 100 Deities Jang Chog puja for the deceased and karmic debtors on Wesak Day. If you wish to participate in this puja or make a prayer gift to a friend or deceased, please submit the name of the deceased or the living donor’s name for karmic debtor below. Please complete and email to us the form below to pohchwee@hotmail.com or nansee.yeo@gmail.com. You may donate any amount for this puja. The Wesak Lamp Lighting: for Individual & Family – RM30; Business – RM50. Please provide your name or business name as well. At the end of puja, the paper tablets of the deceased are burnt away. The fire used in the burning symbolizes the wisdom of the 100 Deities; the burning of the tablets symbolizes the cutting of the attachment of the deceased to a “self” which is the cause of their own suffering. Through the prayer and the ritual performed, the consciousness of the deceased are merged and become inseparable from the wisdom of the 100 Deities, thus they are liberated. By practicing the 100 Deities, like all tantric practices, one is able to purify one’s own mind’s manifestation and transform ordinary thoughts to extraordinary thoughts that leads to recognize the true nature of one self and nature of everything. Lamp offering symbolizes the light of wisdom dispelling the darkness of ignorance, in order to attain Buddha’s luminous clear wisdom. It is also a skilful method to encourage harmony and generate merit while promoting success, prosperity, longevity, peace and love, as well as helping to avert obstacles, pacify the upheaval of the five elements and heal diseases. The enlightened ones do not require the offering of light, this is a means for us to dispel the darkness of our own ignorance and to clear our obscurations and defilements. Because of the association with great good fortune,lamp offerings are made for any individual or family life event that is celebrated, such as the birth of a child, the marriage of a couple, the graduation of a son or daughter, the birthday of a friend, and the anniversary of one’s parents. A lamp offering also carries the wish to attain Buddhahood and the aspiration to recognize the clear light at the time of death, thereby experiencing liberation in that moment. In this way, lamp offerings are associated with transitions in one’s life. 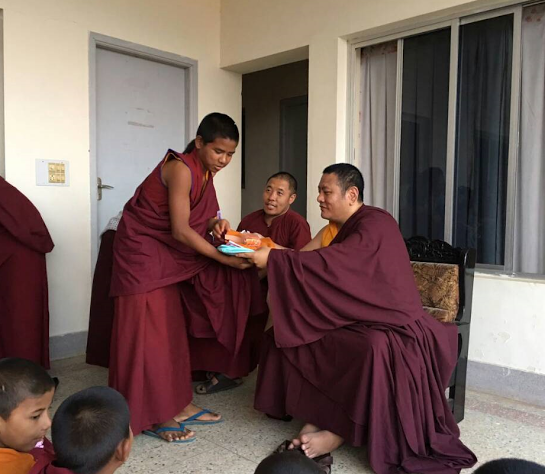 The Monastery will also be offering a set of robes to the Sangha members on 15 February 2018, the eve of Lorsar (Tibetan New Year) together with towel/slippers and other requisites. The robes can be sponsored at RM250/set. If you wish to undertake this meritorious deed, please indicate the same in your remittance. You may sponsor any number of sets as you wish. The young lamas, about 50 of them, will wear these new robes on Lorsar day to welcome the New Year. Kindly email your remittance advice to Sis Kathryn at kathryntana@gmail.com or Sis Poh Chwee at pohchwee@hotmail.com or Sis Beei Huey at mah@wengoon.com.my after you have remitted your contribution to enable them to track your contributions. Please do not omit to email the names of participants and their contributions as we will be compiling them to be sent to the Monastery by 7 January, 2018.